His argument totally discounts any simultaneous actions to create “fair” trade pacts which Trump campaigned on. He portrays this activity as “negative policies revolving around trade.” I suppose the idiot electorate sees this issue a little differently from the ground level. Bill Gross obviously gets what is happening from an economic and government standpoint; but, unlike Trump's outrageous statements on the campaign trail that were successful in tapping many supporters in America, Gross is not connecting with many in the investment community with his rants, and certainly not many Americans who voted for Trump. Maybe he should get on-board and ride the wave that is about to be created, rather than complain so much that things are not fixable. Investors today do not face the situation that Bill Gross did back in the 80s and 90s and early 2000s when interest rates were high, government debt was at a manageable level relative to GDP and interest rates progressively moved lower and lower as US trade policy exposed millions of US workers to global wage deflation. In a nutshell, Gross and PIMCO made a fortune as their US Treasury bond portfolios got exponentially higher in value, at the expense of the long-term labor and capital structure in this United States. Yes, Bill Gross, I said capital investment which you wrongly stated in your November Investment Outlook as being favored in prior administrations (Clinton, Bush II, and Obama) over labor since the early 1990s. In fact, as a rule the borrowing and spending habit in Washington which has grown out of control as the poorly structured US trade deals in the 1990s took hold, has been a US capital formation and labor force killer. 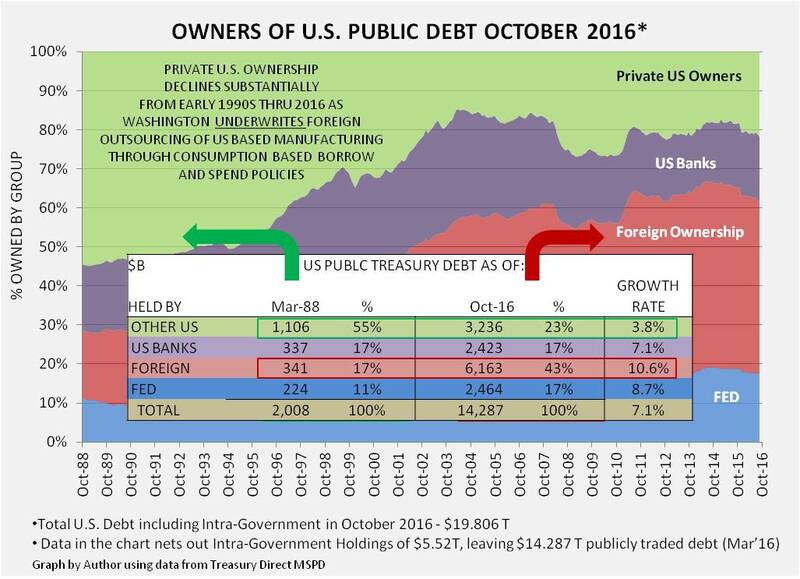 The proof of this statement is contained in the following chart that shows how the ownership of US publicly traded debt, which is well known to be $20T today, became so dominantly held by foreign interests as the trade pacts took root and manufacturing was outsourced to other regions of the world beginning in the 1990s. It may appear that capital formation in the US was favored as interest rates fell and stocks rose through the time period; but, on a relative basis capital has exited the US to be invested in US dollar denominated debt throughout the world in places like China, Mexico, India, and just about anywhere but the US. The only favored capital investment in the US has been so-called “risk-free” US Treasuries, by the very foreign governments who are taking jobs of many US workers in the process. “Free trade” is not defined in any textbook I can find as “come into a country and take what you want." It is a reciprocal relationship in which the dollars that are traded for another country's goods come freely back into the buying country economy, not as debt, but as actual dollar demand for goods or services. This trend of Americans buying goods on foreign credit, underwritten by US trade policy, which took 25 years to reach the excessive point that the US now finds itself, must be reversed to a normal equilibrium in order to fix the economic problems in the United States. If the path chosen is balanced and actually addresses the trade issues while shifting to a fiscal driven rather than solely monetary policy driven approach, Americans who want a fair return for their labor, will profit. Trump's biggest obstacle to actually providing the current and next generation American worker a fair playing field, will be the status quo in Congress, both Republicans and Democrats, and grand standers like Bill Gross who seems to argue that the problem is not fixable, therefore keep things the way they are. These people, stuck in the mindset of the past 25 years when the playbook was simply to borrow and consume more as the American balance sheet of factories and jobs got weaker and weaker, will try to block the trade aspects of the Trump plan at the continued expense of the Rust Belt voters who arguably put Trump in the White House. It is time to get with the program Bill Gross, if you truly believe the system is broken and needs fixed and are not just publishing outrageous newsletters in support of the status quo. It is time to “drain the swamp,” and reverse the 25 year trend of selling out of America. What we have seen over the past 25 years is an immense transfer in wealth. Not the transfer in wealth that is frequently talked about....from the poor to the rich. But, a transfer from one country to countries. From the U.S.A. to China and other countries who took up manufacturing, producing and adding value to well, just about anything. Create (or as some would declare "copy") something that other people want and sell it at a price that will create a profit. Grow your economy that way. Raise your standard of living. But, at what cost?